Greece is a member of the European monetary Union and therefore all transactions are made in euro (€). 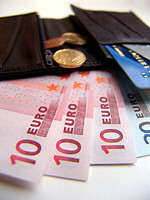 € 500, € 200, € 100, € 50, € 20, € 10 and € 5. One euro has 100 cents. € 0.50, € 0.20, 0.10, 0.05, € 0.02, and € 0.01. There are 11 other European countries using the euro as their official currency: Austria, Belgium, Finland, France, Germany, Ireland, Italy, Luxembourg, the Netherlands, Portugal, and Spain. You will have no trouble whatsoever receiving money from ATMs, as almost every bank has one. You may withdraw money by using your cash cards or your credit cards (AMEX, Euro card, Diners, Visa and MasterCard). Most ATMs have menus in the English language. You will find ATMs at most major tourist and commercial locations, including airports, ports, supermarkets, shopping malls etc. You can exchange currency at a number of locations, but the most advantageous are banks. Exchange booths can be found in the city center near Omonia and Syntagma Squares or at the airports, ports, bus stations and your hotel. All banks and exchange stands have the exchange rates posted.